DIN - B connector (IP65) with three meters of cable. Suitable for solenoid valves with a DIN - B connector for voltages from 12V up to 380V. Please note: when DC is used, the brown pole should be connected to the positive terminal. 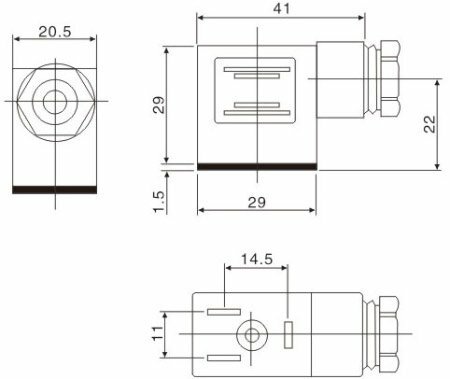 DIN-B connector (DIN43650B) including 3 meter cable (3 x 0.75mm2) for solenoid valves or timers. You do not need to attach the cable to the connector by yourself, so you can get started right away. The LED indication is a handy tool to see whether the valve is activated. Suitable for 12-380V AC/DC. When DC is used please make sure that the brown wire is connected to the positive pole, otherwise the LED does not light up.